The doomsday forecasts for oil prices will have to wait a while. Despite uncertainty in Asia, the price of West Texas Intermediate (WTI) crude oil climbed to more than $100.00 per barrel–good news for North American producers positioned to benefit from this trend. 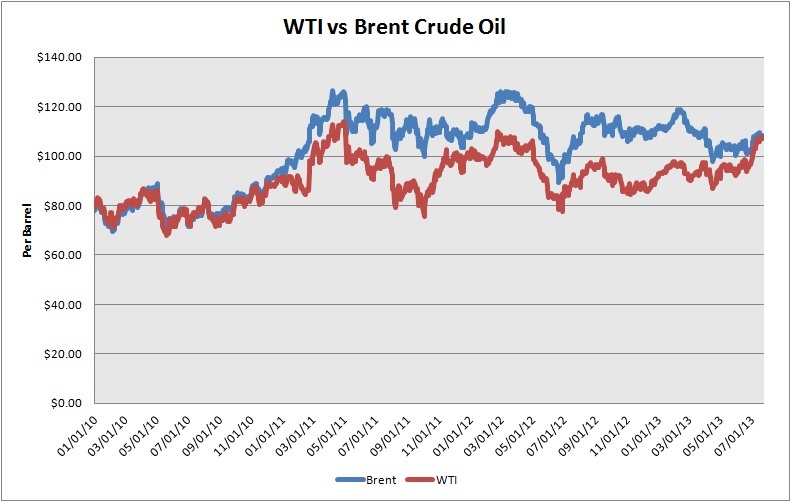 The differential between WTI and Brent crude oil had widened considerably in recent years, reflecting insufficient southbound takeaway capacity at the hub in Cushing, Okla.–the delivery point for the crude-oil contracts that trade on the New York Mercantile Exchange. With rising volumes of crude oil arriving from the Bakken Shale and Canada, the growing supply glut at Cushing depressed the price of WTI relative to Brent and other benchmarks that reflected global supply and demand conditions. 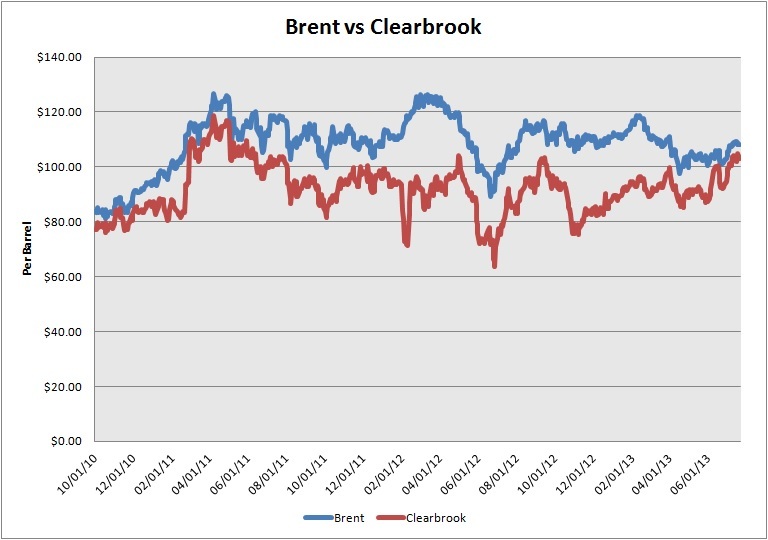 The WTI-Brent price spread has narrowed in recent weeks, reflecting additional pipeline capacity from Cushing to the Gulf Coast, new pipelines that redirect volumes from the Permian Basin to Houston instead of the WTI delivery point, and pipeline outages in Canada that increased Midcontinent refineries’ draw of domestically produced light-sweet crude oil. These developments have also bolstered the price of crude oil transported from North Dakota’s Bakken Shale to the hub in Clearbrook, Minn.
Price differentials have been a particular challenge for Canadian exploration and production companies, which face increasing competition from the upsurge in US oil output and higher transportation costs for delivery to refineries south of the border. 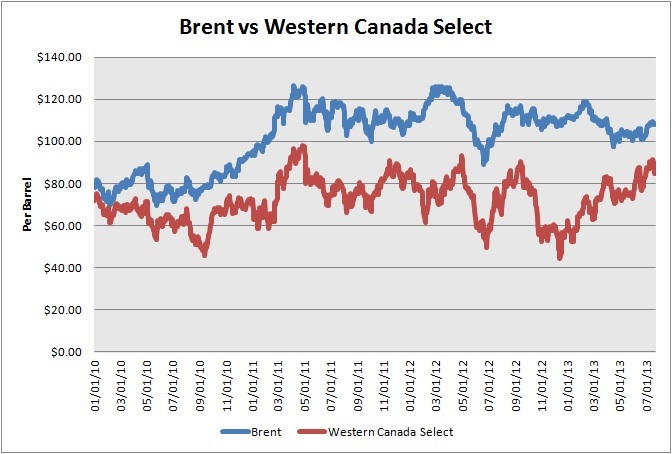 Although the price of Western Canada Select has improved because of temporary pipeline outages, there’s plenty of volatility ahead for this blended crude oil. Even if the Obama administration signs off on TransCanada Corp’s (TSX: TRP, NYSE: TRP) Keystone XL pipeline tomorrow, this project wouldn’t transport meaningful crude-oil volumes from western Canada’s tar sands for several years. With midstream operators also considering pipelines to transport oil-sands output to Canada’s west coast for export to Asia, this heavy crude oil eventually will find a market. Absent sufficient pipeline capacity, Canadian hydrocarbon producers will need to pursue alternative means–rail transportation represents one option–to deliver their oil output to the markets that offer the best price realizations. These challenges are of no real consequence for names that are bankrolled by deep-pocketed national oil companies from China and elsewhere in Asia; these operators can afford to take a long view on the situation. With bulletproof balance sheets and geographically diverse operations, the major integrated oil companies such as Chevron Corp (NYSE: CVX) and ExxonMobil Corp (NYSE: XOM) also enjoy this luxury. However, smaller producers are far more vulnerable to these headwinds–especially those that dish out a sizable portion of their cash flow via dividends. Penn West Petroleum (TSX: PWT, NYSE: PWE), for example, now disburses CA$0.14 per share each quarter, compared to CA$0.34 per month in early 2009. ARC Resources (TSX: ARX, OTC: AETUF) and Vermilion Energy (TSX: VET, NYSE: VET) are two former Canadian royalty trusts that have positioned themselves to endure a challenging price environment. Vermilion Energy generates more than two-thirds of its net income from Europe and Australia, insulating its earnings from a North American energy market that continues to experience growing pains and volatility. This favorable geographic mix has enabled the company to grow its dividend sustainably. Natural gas accounts for about two-thirds of ARC Resources’ production mix, positioning the company to benefit over the long term from plans to liquefy and export the commodity from Canada’s west coast. More important, the conservatively run outfit always lives well within its means and doesn’t push the envelope with its dividend. Both companies weathered the challenging price differentials with aplomb during the fourth quarter–a good portent for what may come. Roger S. Conrad is founder and chief editor of Capitalist Times and Energy & Income Advisor.